“MFA 2011” presents the work of 17 visual artists and 20 musicians and composers concluding their graduate careers in the College of Visual and Performing Arts. On view at the Syracuse University Art Galleries will be a wide range of traditional and contemporary media, including painting, drawing, photography, interactive and experimental sculpture and conceptual installations. The exhibition opens on Thursday, April 7, with a public reception from 5-7 p.m. It runs until May 15. Master’s of music candidates will perform thesis compositions every Thursday at 6 p.m. beginning April 14, for the run of the exhibition. Manipulation of scale and environment is a clear, consistent thread in this year’s exhibition. 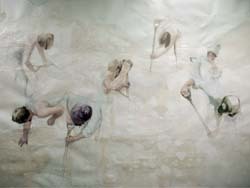 Painters engulf the viewer in their work, through an expansive 17-foot drawing and by the perspective of a 14-foot canvas projecting from the top of a gallery wall. Photographer Shimpei Shirafuji carries a narrative around the perimeter of a room, a contemporary twist on 19th-century cycloramas. An installation of half-toned screen prints by Eric Johanni initially engages the viewer from across the room, and then again once the viewer is directly in front of the work. Other artists utilize the subtlety of scale to create an intimacy that immerses the viewer into the artwork, such as miniature architectural models and unassuming artist performances. Site-specific installations transform galleries into absorbing new environments that influence all of the viewer’s senses, creating ephemeral experiences through sound, performance and media. Documentary films that deal with issues of identity and family will also be on view in the media theater.